The weather is dark and gloomy, you haven’t seen the sun in days and leaving your house is the last thing on your mind, right? Around this time of year, we’re all guilty of counting down the days until summer comes around. However, life in Thessaloniki doesn’t have to stop just because the sun is hibernating. 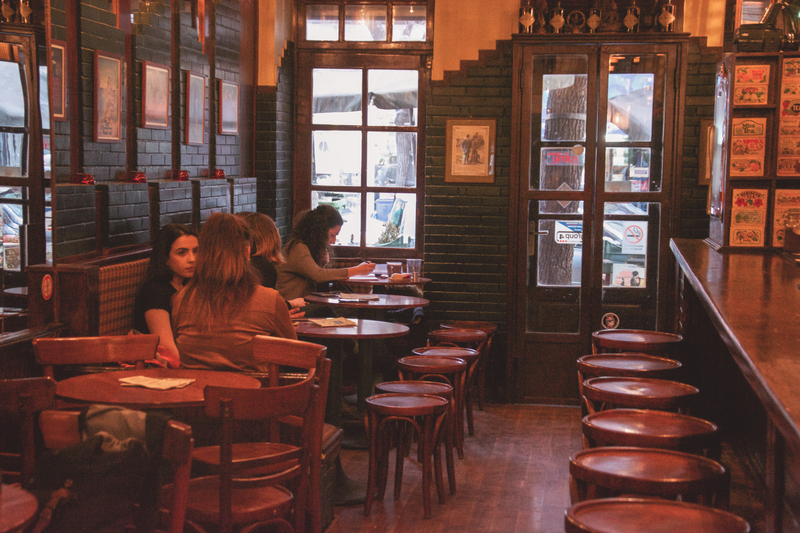 Here are a 6 cozy cafes in Thessaloniki to fight the cold weather. These homely cafes will warm up your heart and soul to last you till the temperature starts rising again. Anemoessa reminds me of a warm Irish pub. The brick walls, the wooden chairs and the long list of beers are almost uncanny. Whether it’s summer or winter, there is always a cozy atmosphere in Anemoessa. Take a look at their specialty hot chocolates or enjoy a warm tea while curling up in this toasty cafe. Sitting on some of the oldest ruins in Thessaloniki, To Palio Hamam is a unique combination of history and pleasure. Come enjoy a warm Greek coffee by their fireplace and let the history of Palio Hamam transport you to another era. Be sure to come back in the summer to enjoy a view of the Ottoman baths from their rooftop bar. There’s something about small coffee shops that make them feel cozy automatically. Well, Elephantas does not disappoint. Although it is small in size, the people there are so friendly and welcoming that you’ll instantly feel like you are in someone’s home. Their combination of funk, jazz, Latin American and reggae music creates a welcoming and relaxing environment to enjoy your coffee or drink at any time of the day. Kafodeio Elliniko or otherwise the “Greek Coffee Conservatory” is a fairly new addition to Thessaloniki nevertheless, this tradition style cafe will transport you back to the good old days of Thessaloniki. 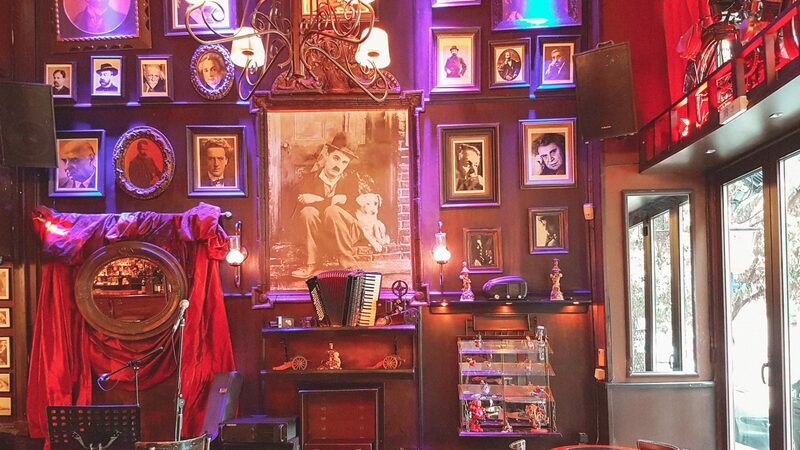 Decorated in black and white photos and antiques, as well as leather couches and chairs, Kafodeio Elliniko creates an all- around vintage and cozy environment. Their menu is definitely one of the longest I’ve ever seen, with countless beers and wines – all worth trying. The most unique aspect of Kafodeio Elliniko is their live musical performances that happen several times throughout the week – most of them shining the spotlight on local artists and musicians. Yup you guessed it, To Palio Elliniko is the sibling cafe of Kafodeio Elliniko. Originally created by two brothers for their love of good company, great beer, and local muscians, To Palio Elliniko is truly one of Thessaloniki’s classic spots. My favorite part of this cozy cafe is their upstairs area, which is surrounded by leather coaches and endless books – a book lover’s haven! TOMS Flagship store in Thessaloniki is the epitome of a cozy wintery cafe. Take a book or your lap top and head downstairs to their living room – like space, to enjoy a hot beverage. You can read more about TOMS here and here. Hope you enjoyed these cozy cafes in Thessaloniki! Be sure to check out 5 cafes to work remotely from here and other urban secrets I stumble upon here.